Money Mischief is a gripping tell-all that exposes centuries of crooked government conspiracies, dangerous backdoor deals with big bankers and powerful insiders, and the real causes behind some of the most dangerous periods in our nation's history . . .
. . . including the 1970s Carter crisis, the Great Depression, and the financial chaos we are experiencing now. Milton Friedman paints a true and unfiltered picture that documents how time and time again Washington, D.C., has attacked the wealth, safety, and freedom of its citizens through INTENTIONAL inflation and a calculated decimation of the dollar. "Only government can take perfectly good paper, cover it with perfectly good ink, and make the combination worthless." Most importantly, in this amazing book, Friedman provides you with a road map for economic survival during these treacherous times of inflation, a weakened dollar, and uncertain markets. If what you'll read in the pages of Money Mischief holds true, the United States' future includes a 1970s-style economic meltdown, followed by a Great Depression-era collapse — and you will be eternally grateful for having this book at your side to guide you. 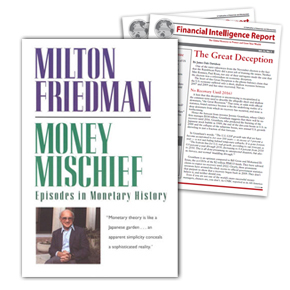 With Milton Friedman's prophetic book Money Mischief as your guide, you can take the absolutely necessary measures to build a wall of protection around you and your family's financial well-being. The Financial Intelligence Report tirelessly searches for ways to protect and grow investors’ wealth — no matter what the financial landscape looks like! The people I am referring to are members of Newsmax’s flagship financial publication: Financial Intelligence Report . This report gives you access to the information historically put aside for the “elite” investors. With this knowledge at hand, you have the chance to join their privileged club. IMPORTANT NOTE: Sales tax included where applicable. Your trial subscription comes with convenient automatic renewal. At the end of your subscription, we'll notify you. If you want to keep the publication, do nothing and we'll renew your subscription using your credit/debit card on file. We'll charge you $109 (or $97.95 for digital) for one year (12 issues) of Financial Intelligence Report and thereafter at the lowest rate then in effect. There is no risk, you can cancel within the first six months for a full refund of the unused portion of your subscription.